These relays are based on microprocessor technology and offer accurate voltage measurement and possibility of setting thresholds and switch off and on times. They may be additionally provided with event memory and detect phase shift and field rotation direction. 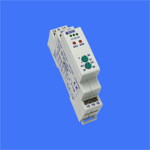 Voltage relays may be also used for protection of equipment supplied from single-phase mains.